There’s a size war being waged at the outskirts of our solar system, and it looks like Pluto may come out as the reigning champ. Ever since its discovery in 2003, the dwarf planet Eris — located in the Kuiper Belt of frozen worlds far beyond the orbit of Pluto — has been a key player in a controversy that has literally rocked the world of planetary science and astronomy outreach. First spotted during a survey of the outer solar system by Mike Brown, a professor of planetary astronomy at the California Institute of Technology, Chad Trujillo of the Gemini Observatory, and David Rabinowitz of Yale University, Eris was initially believed by the team to be a bit larger than Pluto, our erstwhile ninth planet. This caused no small confusion among some astronomers as to what exactly to call Eris. Is it also a planet? Is it a Kuiper Belt Object? Is it a Plutoid? Or something else entirely? And, if the latter indeed be the case, what does that make the supposedly-smaller Pluto? The IAU, at least for the time being, decided on a new term for these worlds: dwarf planets. Meanwhile, beyond Pluto (which, really, couldn’t care less about what it’s called) another world called Eris orbits the sun in a distant region populated by ancient frozen bodies of ice and rock. This is the Kuiper Belt, located billions of miles away, with Pluto and Eris being the best known members thereof. Very similar in size, scientists weren’t sure which was larger… until now. New data presented during a meeting of the American Astronomical Society Division for Planetary Sciences and the European Planetary Science Congress show that Eris may in fact be smaller than Pluto — or at least pretty much the same size. Researcher Bruno Sicardy of the Paris Observatory and the University of Pierre and Marie Curie in France and colleagues came to this conclusion after observation of an important astronomical event called an occultation. On Nov. 6, 2010, Eris passed briefly in front of a star, giving Sicardy’s team the opportunity to accurately measure its size. What they came up with was a diameter of 2,326 km (1,445 miles)… slightly smaller than Pluto’s last-estimated size of 2,338 km (1,452 miles)! Although very close, this latest finding puts Pluto ahead of Eris in the ongoing Width War. Read more about this in my article on Discovery News. 7 miles wider in diameter? Accounting for error they could be identical twins! Pluto is part of the Kuiper belt you say… which planets then does the Solar System (in simple terms) encompass? 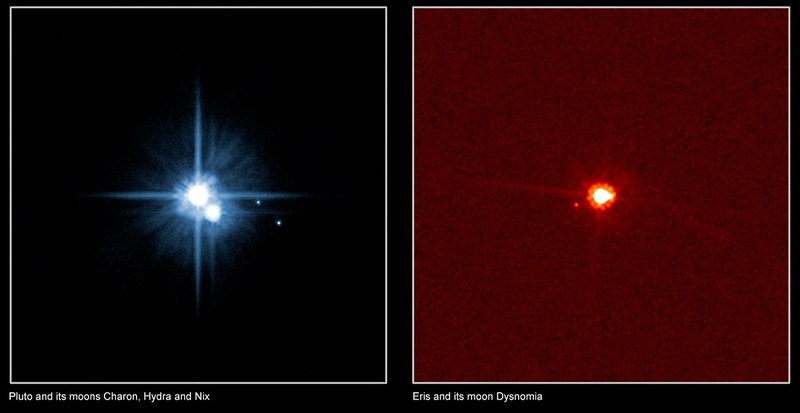 Pluto is probably more than 7 miles wider than Eris. Astronomers are trying not to crush Mike Brown’s fragile ego, for he thinks he killed Pluto and they want to take him back to Earth lightly. When NASA’s New Horizons spacecraft reaches Pluto on Bastille Day 2015, it will, “barring a mishap,” to quote Dr. Alan Stern, Principal Investigator of the mission, and a planetary scientist who coined the term “dwarf planet” and feels they are also planets, just tinier that the big ones, will measure the diameter of Pluto, and probably all its four moons, as well. Until then, be nice to Mike Brown. His ego is very tender and sorely wounded by all this disturbing data.